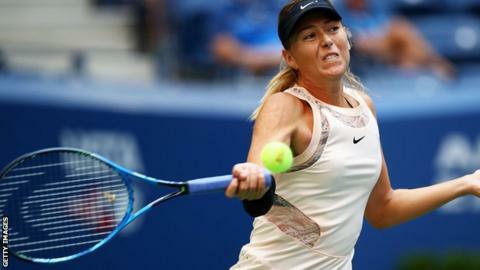 Maria Sharapova relied on her fighting qualities rather than top form to beat Hungary's Timea Babos at the US Open. The Russian wildcard, playing in her first Grand Slam since completing a doping ban, won 6-7 (4-7) 6-4 6-1 to reach round three. Babos had two break points to lead by a set and 4-2 but Sharapova came through in two hours and 20 minutes. "I knew I wanted to get it done and I did," said Sharapova, who beat world number two Simona Halep in round one. "I felt like it was a scrappy match but sometimes those days are the best, because you get through and give yourself another chance." Sharapova was given a wildcard into the main draw as she is currently ranked 146th following her 15-month doping suspension. The decision drew criticism from some quarters but Sharapova received a warm reception from the crowd in both matches. "I think with the way that I played Monday night, I don't think there are any more questions," she said. "I've had an amazing reaction from fans since I've been back, and that's been very special." The 2006 champion will next face American wildcard Sofia Kenin. Sharapova, 30, found it hard to rediscover the form she had shown against Halep on Monday, a gripping contest that electrified the night-session crowd. Inspiration was harder to come by on a sultry New York afternoon in the Arthur Ashe Stadium. Both players struggled for consistency, with Babos, ranked 59th, failing to serve out the first set twice before winning the tie-break. The Hungarian had a golden chance to make a decisive move in game six of the second set but found the net on the first break point, before Sharapova slammed down an ace on the second. Babos would win only two more games as the match quickly raced away from her. "In the second set I felt like I was physically fresh," said Sharapova, who finished with 39 winners and 36 unforced errors. "That gave me a lot of confidence. I just wanted to be the fittest player out there in the end, and I was."